The Alm Haus is a unique Aspen cabin located in the Elk Mountain range of the Rocky Mountains in Aspen, Colorado. Its rustic three bedrooms and two bathrooms are charming and perfect for a small gathering of family or friends. 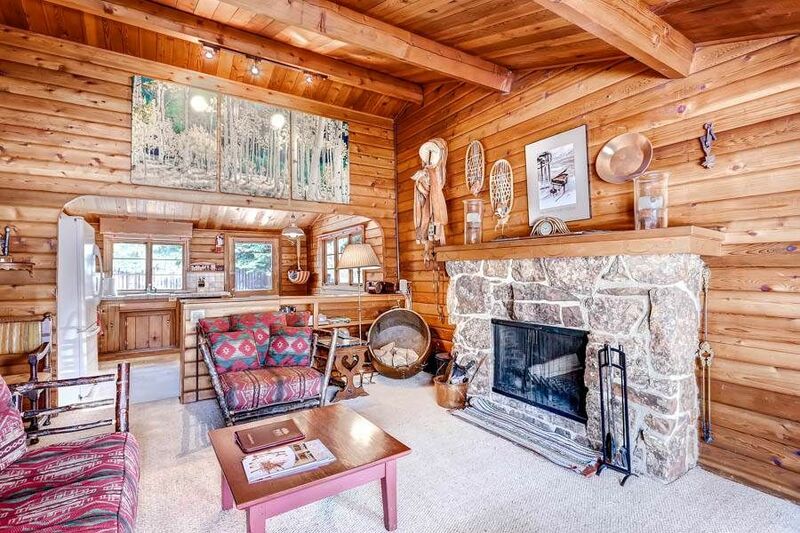 Upon entering the front door, you will be enchanted by the cedar wood paneling adorning the cabin, giving it a true mountain cabin ambiance. The vaulted ceilings with large wood beams continue throughout the home, providing an expansive feel. The lovely and roomy kitchen open up to the living room - a great place to relax after a long day on the mountain or after an adventurous hike. The cabin features a spacious living room with a river-rock wood-burning fireplace, a full kitchen, a washer, dryer, and wireless internet. The large back yard and deck are great for summer grilling and dinner outside and include a Weber barbecue. Enjoy a much needed and rewarding soak immersed in your own private hot tub surrounded by a mountain oasis. The master bedroom has a queen bed, the second bedroom has two twins, and the third bedroom has two twins (which can be made into a king upon request). This property is pet friendly (with a non refundable pet fee). The downtown core of Aspen, offering world-class shopping, dining, and nightlife is just a couple of blocks away. It is approximately a five-minute walk to Aspen Mountain’s gondola for alpine skiing and snowboarding, and there are multiple shuttle stops nearby. Call us, and allow McCartney Property Management’s guest services to open the door to your Aspen cabin experience! Just blocks from the heart of downtown Aspen! This house is a great little cabin. Old school Aspen. Super basic but perfectly located. This house is going to be razed soon so that the $6 million lot on which it sits can have a new McMansion built. Enjoy this slice of old school funky Aspen while it lasts! this place was too dark and the dinginess is really creepy. A maintenance person came without prior notice and left a window open. It happened while we were out, but I didn't feel comfortable leave my dog alone afterwards- which was the only reason we rented this house. I also found it strange that the management somehow makes contact with you every few hours during your stay to remind you about their policy/procedures. Seriously we received emails, envelopes at front door and voicemails every few hours. Some vacation! It is in a very walkable location but so are several pet friendly hotels! We are sorry to note the unbecoming adjectives you have for the Alm Haus. But we so appreciate the review! We have ordered some new lamps and fixtures to brighten the place up some more. We have a number of outlets to communicate with our guests, one being an optionally downloaded app. For as short of a stay as yours, we can imagine how the timeline of communications gets condensed. We just prefer to be more accessible to our guests than not. We hope you still managed to enjoy all that Aspen has to offer.